CINCINNATI -- Construction will begin within days to stop an East Side hillside from slipping down on homeowners. One part of a retaining wall along Riverside Drive is already complete. Homeowners there haven't paid the cost, because, according to the city, an ongoing landslide threatened water and sewer utilities. Many homeowners have spent thousands of dollars on emergency repairs, however. And for some, like Steve Helmuth, the big fix might be too late. Helmuth's sewer line has a break where it comes out of his house. He's spent "quite a few nights" in hotels because of sewer backups. 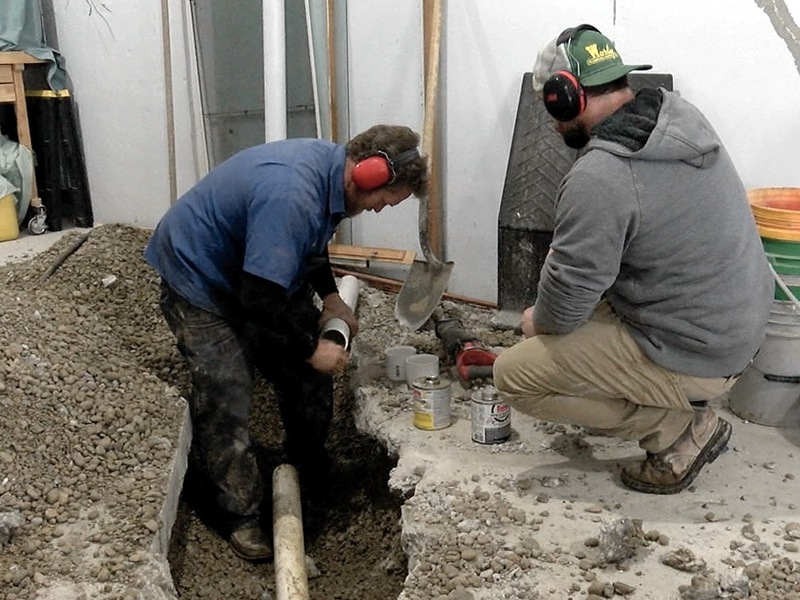 A jackhammer pounded outside Tuesday, clearing the way for crews to get at the problem. "Today’s work is going to be right around $10,000, and we've spent way more than that on other work on the house and that’s not even really repairing it," Helmuth said. Once the hillside is stabilized, Helmuth said he'll have his home assessed to see if it would be just as expensive to build new as to repair. Other homeowners will face similar decisions. The first part of the wall, between Hazen and Vance streets, came in under its $10 million budget, according to City Manager Harry Black. That landslide is stabilized, and retaining wall drains are tied into the sewer system. New stormwater drainage will take hillside runoff under the street and sidewalk, Black's memo said. The city found more hillside movement east and west of the construction site last spring and summer and decided to extend the wall. "This has been a living nightmare for the past year-and-a-half," said Patrick Ormond, East End Community Council president. He's hopeful the wall will shore up not only the hillside, but also confidence in his neighborhood. One option would've had the wall built right along Riverside. Teri Joiner praised the city for listening to residents about the wall's location. "I'm just ecstatic that they realize that this is a critical situation and that they are the only ones that have the solution," Joiner said. "We as homeowners could not build the retaining wall." Black said the second part of the project won't cost more than $10 million. Greater Cincinnati Water Works is carrying most of the $20 million cost. Duke Energy has committed to pay about $3 million. Black said the city wants Hamilton County to agree to share the cost, too, because the work helped sewer infrastructure.